As we made our way to the top of the Great Hangman yesterday with only a few grazing ponies and a stiff breeze for company, it felt as though we were passing through a landscape that hadn’t changed for thousands of years. There isn’t a great deal of Roman archaeology in North Devon: the invaders and the Dumnonii seem to have successfully ignored each other for much of the occupation. 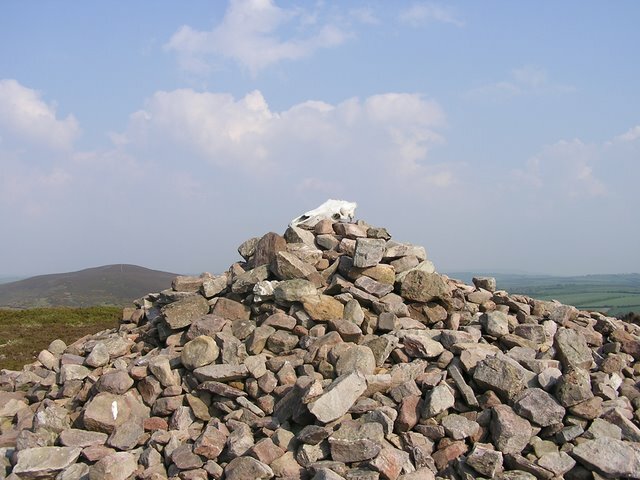 Which is why, seeing a horse’s skull resting on the top of the summit cairn, it was almost possible to believe the tribespeople were still hidden down in the valleys, living in their roundhouses, tending their sheep and minding their own business. Hello Ruth, I love this post, especially the skull. (I wonder who put it there.Some neopagans or an inventive farmer?) It confirms my research (and intuitions) about the Dumnonii. The Dumnonnii play a strong supporting role in a WIP I am just finishing. The main characters are Durotriges and someday I hope to see their homeland hillfort, Mai Dun, or Maiden Castle as it is now known. I envy you tramping about in that part of England. How good to know that somebody is giving the Dumnonii a voice! As for the Durotriges – Maiden Castle is really stunning: I hope you get the chance to visit before long.